These panels originally formed the central elements of a multi-panel altarpiece from the Chapel of the Apostles in the Church of San Domenico, in Perugia. Its lost side panels probably depicted standing saints. Unusually for a work of this period, it is signed and is dated 1428 (on the scroll at the bottom). It was painted by Pellegrino di Giovanni (active 1397-1435), one of the leading painters in Perugia in this period for the wealthy Perugian merchant, Nicola di Giovanni di Benedetto di Giovanni. Pellegrino included Nicola's coat of arms, a gold lion on a blue field, at the bottom right of the panel. At bottom right is the symbol of the merchants' warehouse on the Piazza Grande, near Nicola's residence. 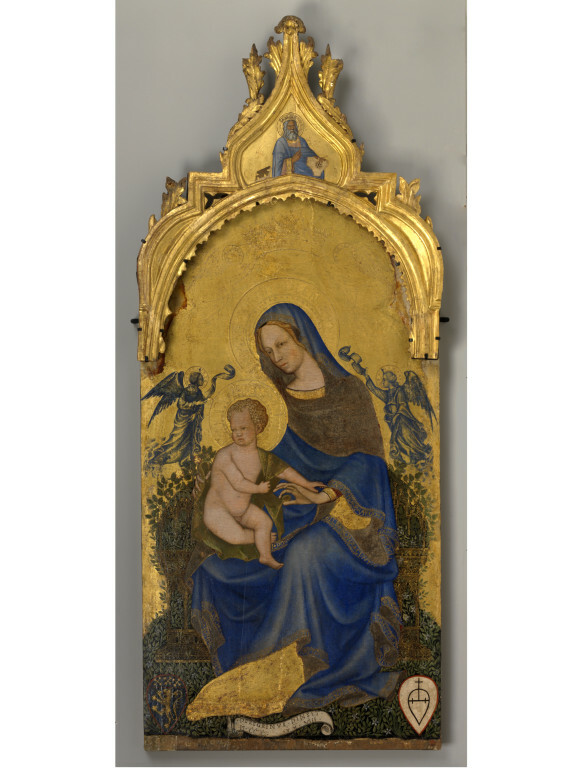 The pose of the Virgin, the leafy gothic throne on which she sits, and the angels incised on the gilded background, derive from an earlier altarpiece, also in the Church of San Domenico, by the celebrated painter Gentile da Fabriano (active 1385-1427). Pellegrino presumably signed and dated his work in imitation of Gentile, who often did so. The Virgin and Child enthroned, flanked by angels. A coat of arms on the lower left (azure 3 sautoirs or, azure lion displayed or) and on the right a merchants mark (shield surmounted by orb); In the cornice of the frame: David holding a psaltery. Inscribed on the scroll at bottom: Peregrinus. pinsit. MCCC[C]. XXVIII. The fragmentary inscription 'Ave Maris Stella' appears on the hem of the Virgin’s mantle. Bought by the Museum in 1860 for £70. Signed by Pellegrino di Giovanni and dated 1428 (‘PEREGRINUS PINSIT MCC [C] C XXVIII’), this work was commissioned by Nicola di Giovanni di Benedetto di Giovanni, a wealthy merchant resident in the Porta San Pietro in the parish of Santa Maria del Mercato, in Perugia. His arms are represented in the coat of arms at the bottom left; three St. Andrews’ crosses terminating in fleur-de-lys in a row above a golden lion on a blue field (azure 3 sautoirs or, azure lion displayed or). The merchants mark in the shield at bottom right is that of Nicola di Giovanni’s warehouse, which was situated on the Piazza Grande, near his residence. The fragmentary inscription 'Ave Maris Stella' appears on the hem of the Virgin’s mantle. The altarpiece to which this panel formerly belonged was originally in the chapel of the Apostles in the church of San Domenico in Perugia. It is not identifiable in Boarini’s Descrizione Storica of this church, published in 1778, and by the eighteenth century had been transferred to a church at Vaiano, a small town near Lake Chiusi about thirty-five kilometres west of Perugia. Historical significance: Pellegrino di Giovanni di Antonio is a little known Italian painter, who worked primarily in Perugia where he died in 1437. His father was a Florentine resident in Perugia and may have been a member of the guild of stone and wood carvers. In 1428 Pellegrino was appointed bursar or camerlengo of the painter’s guild. By 1431 he was in partnership with a glassmaker to manufacture windows and sometime prior to February 1435 he painted a panel for Giovanni di Martino Bontempi, a member of an illustrious noble family, for the ‘Chapel of the Angels’, in San Domenico in Perugia. Following his early death in 1437, his workshop and assets passed to his pupil Mariano d’Antonio. 6559-1860 forms the central panel of an altarpiece Pellegrino painted in 1428 for the Chapel of the Apostles in the church of San Domenico, Perugia. It was commissioned by Nicola di Giovanni di Benedetto di Giovanni, a wealthy merchant resident in the Porta San Pietro in the parish of Santa Maria del Mercato, Perugia. His arms are represented in the coat of arms at the bottom left while the merchants mark in the shield at bottom right is that of Nicola di Giovanni’s warehouse, which was situated on the Piazza Grande, near his residence. Pellegrino's composition derives from Gentile da Fabriano’s (ca. 1385- 1427) Virgin and Child also from San Domenico (now in the Galleria Nazionale dell’Umbria). In addition to correspondences between the general pose of the Virgin and the attitude of her hands, Pellegrino repeats Gentile’s idiosyncratic throne, comprising a gothic framework filled with lush vegetation. This rustic seat has customarily been interpreted as expressive of Mary’s humility, but may also refer to grassy bench in an enclosed garden. Pellegrino also adopted Gentile’s incised angels although he elected to colour the lower of these in blue. The design of the gable of Pellegrino’s altarpiece and its figure of King David holding the psaltery are reminiscent of Gentile’s Adoration of the Magi of 1423 in the Uffizi. They perhaps follow the lost frame of Gentile’s Virgin and Child. The Virgin and Child was one of the most popular subjects in Italian altarpieces during this period. 6559-1860 probably originally formed the central panel of a polyptych, with additional panels (now lost) on both sides. It has been suggested that these flanking panels are identical with four panels of the Life of St. Benedict currently divided between the Uffizi in Florence and the Museo Poldi Pezzoli, in Milan. The church of San Domenico, for which this altarpiece was made, is one of the principal churches in Perugia. Begun around 1304 and consecrated in 1459, the church was much altered in the seventeenth century. The city’s leading families, especially those from the district of Porta San Pietro, contributed numerous legacies to this Dominican convent. Its church contained many funeral monuments, and was richly adorned with liturgical hangings and altarpieces, including paintings by Duccio, Fra Angelico and Filippo Lippi, as well as Gentile and Pellegrino. The Chapel of the Apostles, where 6559-1860 was originally installed, is located next to the choir and immediately to the right of the High Altar. This has a vault decorated with frescoes of Dominican saints attributed to a follower of the Sienese Taddeo di Bartolo (ca. 1362/3-1422). As these probably belong to the same programme of decoration as 6559-1860, they may also have been painted by Pellegrino. Indeed the V&A picture is the touchstone for Pellegrino’s style, and the panel of St. Michael the Archangel (Museum of Fine Arts, Boston) has been convincingly attributed to Pellegrino on the basis of comparison with the V&A picture. By the eighteenth century, San Domenico had been remodelled in the Baroque style, and the altarpiece, now old-fashioned, was removed to the provincial setting of Vaiano. It must have been dismantled and dismembered at some point in the 19th century before its acquisition by the Museum in 1860 for £70. This appears to be the central panel of a polyptych or multi-paneled altarpiece. An altarpiece is an image-bearing structure set on the rear part of the altar, and which normally declares to which saint or mystery the altar was dedicated. Its form and content customarily evoke the mystery or personage whose cult was celebrated at the altar. Altarpiece forms vary enormously, and may include movable statues, relics and sacrament tabernacles among other elements. The original association of the Christian altar was with the tomb of a saint, and theologically with the tomb of Christ. Altarpieces adorned both high altars and side altars. High altars often carried large altarpieces with elaborate programmes while side altars served a more private piety and their altarpieces were often endowed by private individuals. In Italy, the altar became a primary setting for painting on panel, a format developed in the West from the example of Byzantine icons. An early format, consisting of gabled panels in a vertical format representing a full-length saint flanked by scenes of his or her life, soon developed to include an elaborate gabled outer structure enframing several vertically conceived individual compartments to form a Polyptych. Polyptychs were increasingly elaborate, their frames often featuring piers, colonettes, cusped arches, tracery, pinnacles, crockets and finials, eventually transforming the altarpiece into an architectonic structure resembling in detail and spatial principles the façades of contemporary full-scale Gothic architecture. In Italy such altarpieces were usually made of wood and painted, while in northern Europe they were commonly executed in stone. This work was painted for a Dominican church in Perugia, Italy. Since the twelfth century Perugia, the principal city in Umbria, had been a thriving independent republic under papal protection. It was dominated by nobles, bankers, merchants and middle class artisans, but in the later fourteenth and fifteenth centuries was increasingly afflicted by economic decline and social instability. As elsewhere in Italy, its economic and architectural development coincided with the growth of the mendicant orders of friars, and particularly the Franciscans and Dominicans. Their churches frequently served as parish churches, and in return for alms, wealthy citizens were permitted to establish private chapels within them. Such chapels were used for votive masses and private prayer, and furnished with altarpieces and fresco cycles. They could express their patrons’ aspirations to piety, and demonstrate their wealth and taste. Gentile da Fabriano : studi e ricerche / a curi di Andrea de Marchi, Laura Laureati, Lorenza Mochi Onori. Milan: Milan Electa, 2006. Kauffmann, C.M. Catalogue of Foreign Paintings, I. Before 1800. London: Victoria and Albert Museum, 1973, pp. 215-216, cat. no. 270. 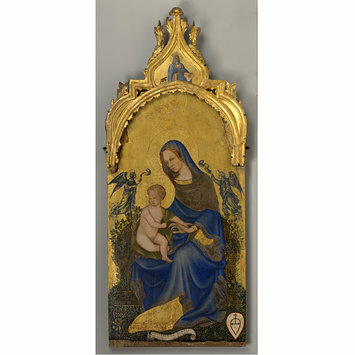 Following its acquisition, 6559-1860 was catalogued as School of Modena, but from 1896 was generally associated with Gentile da Fabriano and subsequently noticed to derive specifically from Gentile’s Virgin and Child, also from San Domenico, and now in the Galleria Nazionale dell’Umbria in Perugia.